You read that right – an Amish smoking study. Many are surprised to learn that some Amish people smoke. A certain segment of Amish (notably Lancaster County) produces tobacco as a cash crop. Smoking is considered a part of tradition in some Amish communities. And as in any population you’re going to find some smokers just as you do drinkers, drug users, Boston Creme donut addicts, and so on. 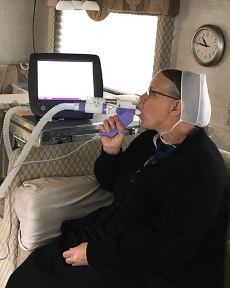 University of Maryland researchers recently completed a study on the effects of secondhand smoke in the Lancaster Amish community. Interestingly, it showed different harmful effects for women vs. men, and was significant beyond that (more below). First, the advantages of using the Amish for this kind of study? For one, their lifestyle makes it easier for scientists, because they don’t have to control for so many variables. Amish families live in similar ways to one another – with generally active lifestyles and similar diets. As noted here, previous research on the effects of smoking and secondhand smoke “have been difficult to interpret due to variables in the socioeconomic status and educational level of participants.” Amish subjects make for clearer and easier to interpret results. Also, cigars and pipes are common with the community’s smokers. These produce a more harmful secondhand smoke. A third benefit of using the Amish, which I note in this post’s conclusion, is about a different type of exposure. The researchers examined data on a cross-section of 3,568 Amish who participated in three community surveys of cardiovascular health between 2001 and 2015, according to the University of Maryland Medical System. The data included tobacco use and secondhand smoke exposure from family members. Because the researchers had records of familial relations in the community, they were able to determine which people had a father, brother or husband who was a smoker and thus conclude that they had been exposed to secondhand smoke. The researchers also tested lung function and took blood samples. The researchers did not have to account for potential smoke exposure in the womb since women in the Amish community generally do not smoke. About a third of Amish men in the study smoked, with 64 percent smoking cigars, 46 percent smoking cigarettes and 21 percent smoking pipes. Reed said cigar and pipes produce more noxious secondhand smoke than cigarettes. The research, conducted in a Pennsylvania Amish community where virtually no women smoke, found that women who were exposed to secondhand smoke had a greater risk for cardiovascular disease, while men exposed to secondhand smoke tended to have a higher body mass index (BMI). Additionally, both men and women had higher LDL cholesterol (the “bad” kind), with women also having lower “good” cholesterol (HDL). Both sexes had higher fasting glucose levels (related to metabolic health). A small percentage of women also had reduced lung function. “The study confirms that even a small amount of secondhand smoke is harmful; it confirms prior findings and extends them by adding to the degree of certainty we have in the harmful associations we are seeing,” says Reed. He adds that the findings suggest the possibility of a significant role for mechanisms less clearly established in secondhand smoking, but recognized in association with active smoking, such as HDL and BMI. Tobacco smoking is faulted in nearly half a million deaths annually. Over 40,000 of those have some connection to secondhand smoke exposure. You can find the study in full here. I dislike secondhand smoke because I find the smell unpleasant and because it infringes on the freedom of non-smokers. Any health effects when a nearby neighbor lights up are not immediately seen, but may be slowly accruing among non-smokers over the years. I understand it’s pretty difficult to quit though. Hopefully a study like this will be another drop in the bucket to help motivate those who want to quit, to do so. We might not have expected it to come out of the Amish community, but with the Amish as subjects it will certainly get more public exposure than your average research study. It always surprises me to hear that the Amish allow (if not embrace?) the same bad habits as the English, especially any kind of “substance” abuse. I’m guessing some districts are stricter than others and, possibly (?) FORBID smoking as part of their Ordnung? Still, smoking seems fairly widespread if this 15-year study could be accomplished! How about chewing tobacco? Is that also common among the Amish? Just curious. You are right, Alice Mary. There are many Amish church groups who strictly forbid tobacco use, some that strongly discourage it, others who tolerate it, and some who embrace it. In our community, the New Orders strictly forbid tobacco use of any kind. In our church group it is very strongly discouraged. I am only aware of one man in our church who smokes and he is very careful to do so “out of sight.” (And for all I know he may have managed to kick the habit by now — I know he was trying.) He is an older man. Not so many years ago there were more of our people who smoked, but as health and moral concerns grew, we saw most people quit and the attitude towards smoking change. Here and there they may be other older people who never managed to quit or didn’t want to, but again, in our immediate group it is rare and very much frowned upon. If they do not have an allotment, I wonder if they are using a religious freedom argument to stay out of jail. I have grown it, but for me (someone without the Federal permission slip) I could end up in serious trouble if I went and sold some.